Fierce and colorful, the opalescent sea slug (Hermissenda crassicornis) is a nudibranch to look for in the tide pools along the Pacific coast. An opalescent sea slug (Hermissenda crassicornis) photographed at the Loveland Living Planet Aquarium in Draper, Utah. As a fierce fighter, this milky, colorful, iridescent nudibranch is well adapted to survive in marine ecosystems. Opalescent sea slugs (Hermissenda crassicornis) live in rocky tide pools and to a depth of about 37 meters (120 feet) in waters of the Pacific coast, from Alaska to Mexico. 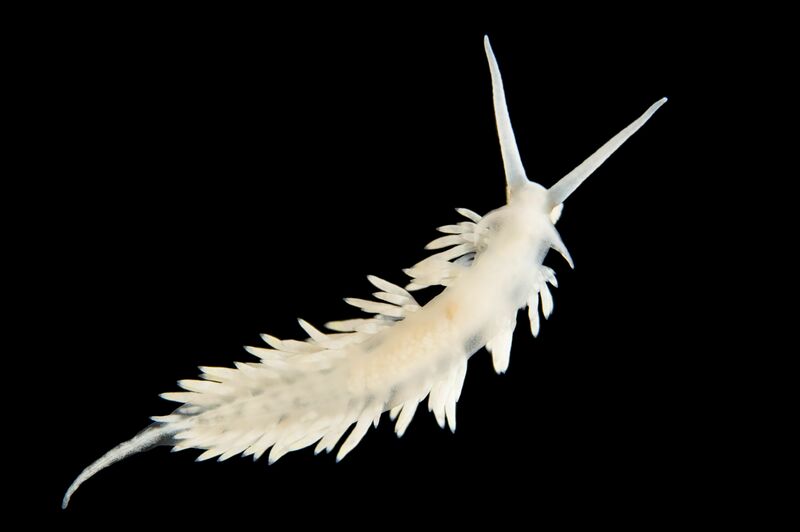 Opalescent sea slugs eat hydroids (one life stage of the hydrozoa) and small sea anemones, which sting most predators or anything that touches them. Instead of feeling the sting, the opalescent sea slug ingests the stinging cysts from the prey and uses them for its own defense. Without harming the sea slug, the stinging cysts pass through its digestive system and are sent to the ends of the finger-like extensions along the body, called cerata. The sea slug can then sting its predators with those stinging cysts—from its own cerata. Opalescent sea slugs also feed on bryozoans, sea squirts, annelids, small crustaceans, tiny clams, and any dead animals they find. They are an aggressive species and will even fight other opalescent sea slugs, lunging and biting. When the fight ends, one eats the other! These sea slugs lay eggs in a string of tiny, sausage-like pink or white cases, attaching them to algae or eelgrass. Each egg case holds one to four eggs, which hatch as larva after one week. The larvae swim into and live within plankton while they grow and undergo metamorphosis, emerging as tiny organisms that look like the mature adult. Why might the opalescent sea slug have evolved to be so brightly colored? Experts think the bright colors of the opalescent sea slug serve as a reminder to predators to stay away—or suffer from a mouthful of stinging cells. What are two key differences between nudibranchs (such as the sea slug) and their snail relatives? Nudibranchs do not have shells or coiled bodies, as snails do. We know that nudibranchs evolved from shelled snails because, in the larval stage, nudibranchs develop a shell that is lost during metamorphosis. What can you do to help protect the shoreline waters where opalescent sea slugs live? The shorelines where these sea slugs live are often areas that are easily polluted. You can help keep the water clean by making sure products with harmful chemicals, such as paint and motor oil, are properly and safely disposed of. long, pointed structures that aid in respiration, found in the upper body of some nudibranchs and other mollusks. sack on the body sometimes filled with fluid. life phase (polyp) of the class of animals known as hydrozoans. displaying a wide range of colors that appear to shimmer and change depending on the angle of view or the angle of illumination. complete change in form and structure from one part of the life cycle to the next, such as caterpillar to pupa, and pupa to butterfly. type of marine animal related to corals and jellies.